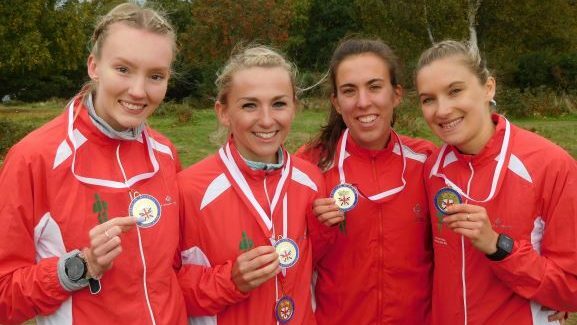 ldershot Farnham & District's runners claimed two titles in the National road relays at Sutton Coldfield on Saturday. It was the eleventh in twelve years for the senior women in their 4-stage event. They were anchored by Louise Small who is coming back from an injury that thwarted her aim to compete in this summer's European Athletics Championships and she clocked the event's fourth fastest time. The event's fastest time had been recorded by the AFD athlete on the opener. Emily Hosker Thornhill finished nineteen seconds before Leeds City's Stevie Stockton, a fellow international. The North of England champions went ahead on the second leg as AFD's Laura Gent was overtaken by Lucy Crookes who finished four places in front of her at last season's English Cross Country Champs. Amy Griffiths retaliated by posting the event's seventh fastest time and turning a deficit of three seconds into an advantage of fifty-three for AFD at the final changeover. Small then extended the lead by another forty over Claire Duck, a team mate at the last World Cross, who brought Leeds home in second place. AFD's under-15 boys were first and second in their race of three stages. Charlie Wagstaff was fourth on a first leg that saw the four fastest times recorded for the event. On the second leg, Ryan Martin equalled Wagstaff's time when he put AFD into a lead of fifteen seconds and Michael Gar clocked the eighth fastest when moving AFD's B team up to third after taking over from Alfie Spear. Woody Jerome's advantage for the A team was exactly a minute over Max Duckworth who anchored the B but the latter could not be awarded silver because of the rule that clubs can have only one set of medals per race. AFD's C team of Harry Hyde, Rudi Morrell and Liam Stone came eighth. AFD's senior men gained a set of bronze medals. They reached the halfway point of their 6-stage contest in seventh, following legs by Ben Bradley, Josh Grace (equal sixth fastest overall) and Luke Prior. Jonny Hay moved them up to fourth and Ellis Cross to third, which Richard Allen maintained to the finish by recording the equal third quickest performance. There was also a set of bronze medals for the club's u15 girls. Ruby Horton's time for eighth on the opening stage was beaten by only two others during the rest of the competition. Rachel Gillett then promoted her side to second, fifteen seconds off the lead, but on the last leg Holly Weedall ran the fastest time overall as she took Vale Royal past AFD's Pippa Roessler and Windsor Slough Eton & Hounslow's Jasmine Young to claim victory for the Cheshire side. The day's proceedings had begun with the u13 boy's event where James Hayward, Henry Rattray and Dan Shattock (fifth fastest} were sixth for AFD.